We’re continuing to track the potential for heavy rainfall on Friday, Friday night, and Saturday morning as a strong front moves through the region. Unfortunately, the models remain highly consistent in forecasting a wet night, with the potential for widespread totals of 2 to 5 inches of rainfall, and some bullseyes of up to 6 to 8 inches. The atmosphere won’t be too favorable toward severe weather, so the primary threat is heavy rainfall and the potential for some light to moderate flooding. Conditions today will be a lot like those on Tuesday, which is to say a cold start, followed by a sunny warm up into the low 60s. 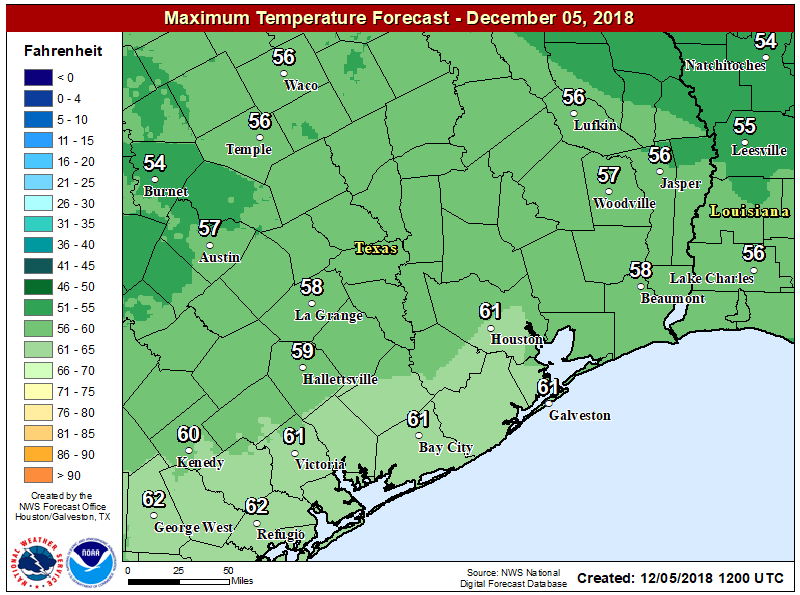 However, a subtle wind shift from the northeast to the east later today will allow for a few clouds to develop later tonight, and should moderate low temperatures to around 50 degrees in Houston—colder up north, a bit warmer along the coast. Winds will shift to come from the southeast on Thursday, and this will represent the return of a moist, onshore flow from the Gulf of Mexico. This will help ramp up moisture levels ahead of the front, but it won’t manifest in rainfall immediately. Instead, Thursday will be a mostly cloudy affair, with highs in the mid- to upper-60s, and those southeasterly winds. The main event will occur as an upper-level low pressure system slides down into Texas on Friday, bringing the best focus for rainfall Friday night in the Houston area. Heavy rains will be possible before midnight Friday, and after sunrise on Saturday, but we expect most of the region to see most of its rainfall during these nighttime hours. As you can see, both models show significant bullseyes of rainfall in the 7-to-8 inch range. 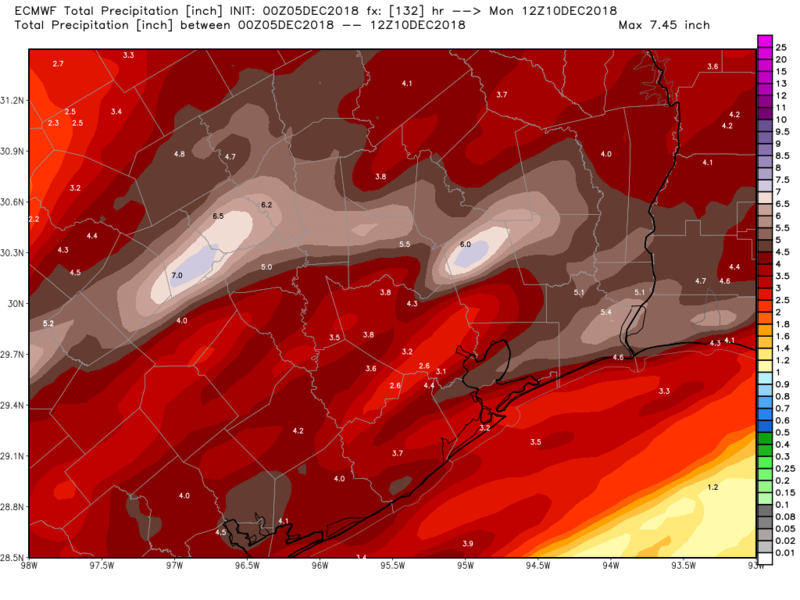 But the European model has the heaviest rains immediately north and northwest of Harris County, while the GFS model has them much further to the north, near Crockett. 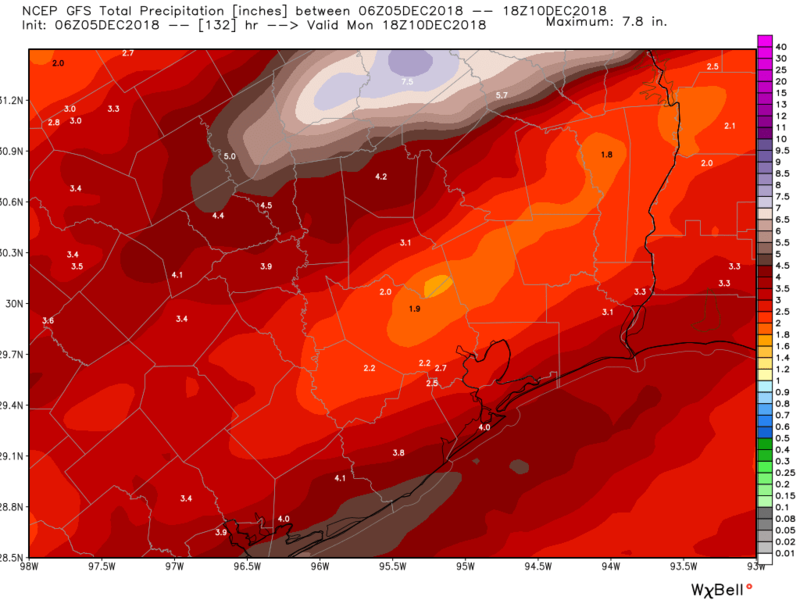 Thus, while we continue to have high confidence in significant rains coming to southeast Texas late this week, we can’t say where the greatest amounts are going to fall. We may not know this Friday, and even then we will have some uncertainty. Rains should end before noon on Saturday, and a colder, drier air mass will move into the region. Highs Sunday and Monday probably won’t get much above the mid-50s, and overnight lows will drop down to around 40 degrees in the city. Sunny skies will prevail from Sunday morning onward. 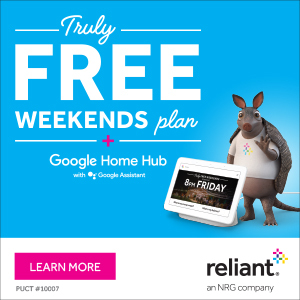 I have an outdoor event to coordinate Friday evening in the Tomball/Cypress area from about 6pm – 8pm. Any idea if the HEAVY rain will hold off until after that time frame? Should we expect a repeat of 2016..Tax Day and/or Memorial Day floods? Checking resources, many of the same rain totals exist…. Am planning to drive to Dallas Friday afternoon. Is heavy rain expected between here and Dallas, enough to make travel unsafe? The Tax day flood brought 16 inches of rain to Houston, and this one is bringing 3-6 inches of rain. Granted the current prediction is 3-6″ widespread, but the isolated (which looks more condensed than isolated to me) is supposed to be upwards of 8-10″ or more. So, match that fact pattern to the above stats (from NOAA). This missing link is whether the rain rates will be per hour or total…..if that 3-6″ is in an hour, we are in trouble. Regardless, NOAA has already said the flooding of rivers will be minor-moderate with certain ones reaching major flood stage. The bottom line: watch very closely and prepare. Flying from San Antonio to Hobby at 5:40 pm Friday…do you think the weather will impact my ability to get to Houston? Yo. Label Houston or Harris County on these maps please. Thank you soooo very very much, Eric and Matt………..you truly are the Walter Cronkite(s) of the Weather! Thank you for your passion, we are so very fortunate to have you! Yes, please. A map with no cities, freeways or borders is useless. The county in the center of the map is Harris County (the county with the black 1.9 inside it on the lower map). Galveston Bay is the one the pops in from the Gulf. Harris County is the one above and to the left. Oh, dear… do I have to go through my “how much rain will fall in the NE corner of my back yard at precisely 2:31:20 AM” rant again? Yup, cause they expecting moderate flooding, but can’t rule out major either….so here we go again…. The prediction models are only accurate until 2:31:19 AM. How far out does the “up in HRRR” forecast go?